Forex Trade Idea: Start of EUR/USD Downtrend? Is the EUR/USD rally over? This technical setup suggests so. One look at EUR/USD’s 1-hour chart tells us that the pair had just broken below a rising trend line that had been solid since the start of the month. And if that’s not enough to make us think twice about buying the euro, then we should also note that the 100 SMA has just crossed below the 200 SMA. So is EUR/USD in for a reversal? There’s no such thing as a sure thing. Okay maybe the fundamental analysis is not looking good for the euro right now. After all, Greece’s creditors had just rejected Greek PM Tsipras’ proposal submitted last weekend. For a while we believed that Greece’s show of compromise was enough for the euro zone leaders. But now that the proposal is off the table, it feels like Greece and its creditors are back to square one. Though I’m crossing my fingers that we won’t see a Grexit anytime soon, I’m also not holding my breath that a deal would be reached by the end of the month. In fact, market players would at least want to hear optimistic statements from Greece’s creditors (not Tsipras and his gang) before we see the euro bulls pounce. For now I’d like to take advantage of the overall euro weakness. The 1.1250 level is looking like a good spot to short as it’s near the 50% Fib and 100 and 200 SMAs on the 1-hour time frame. I’ll wait for the pair to reach the level and see if the markets are still feeling cautious over the euro during that time. I’m planning on placing a stop loss 100 pips away, which places it above the SMA and Fib levels. Lastly, I’m thinking of the area just above 1.1000 as my initial profit target. What do you think? 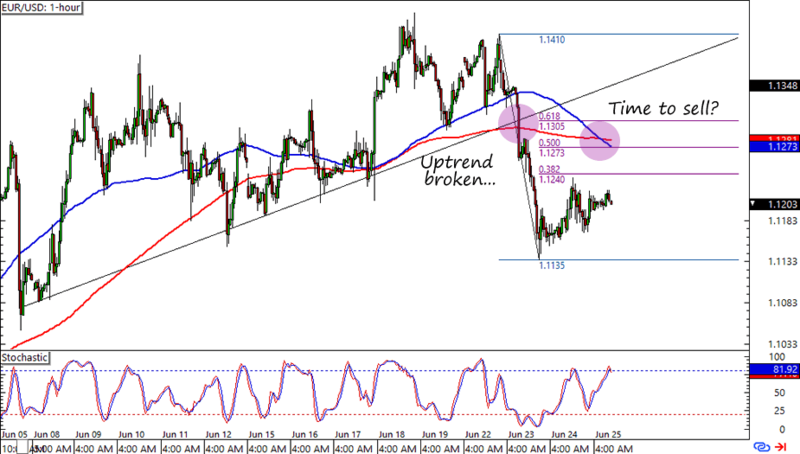 Are we seeing the start of a short-term EUR/USD downtrend?